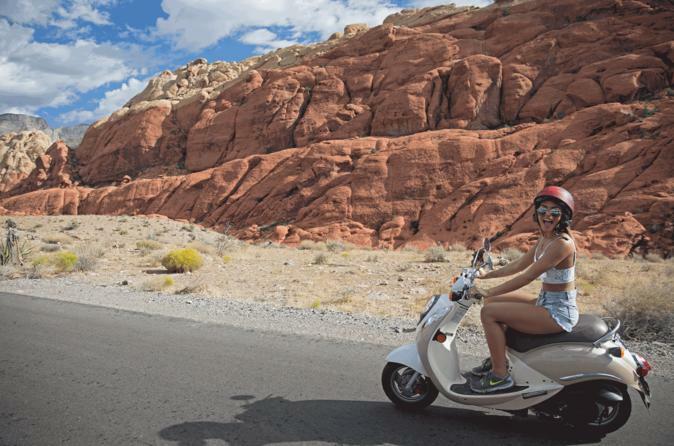 Red Rock Scooter Tours is one of the best and most fun things to do in Las Vegas! Ride through the awesome Red Rock Canyon, one of the world's most beautiful scenic places, on your scooter with the wind in your hair and a smile on your face! If you ride bicycles, then you will learn how to ride like a pro in minutes. There is a free shuttle service to and from most major Las Vegas strip hotels. See awesome rock formations unlike any in the world - be prepared to be amazed. Scramble and climb on rocks - you'll feel like a kid again for sure. Learn about the area's history, geology, wildlife and fauna - all from an experienced, professional guide.